In a community desperately trying to establish some sense of normalcy, Dan Savoie caused quite a commotion at Wadena’s First National Bank a few weeks ago when he strolled into the downtown building toting a stool. Jamie Pettit, the bank’s executive vice president, sprung to his feet and started yelling when he saw Savoie, Wadena’s boys’ hockey coach. “He was yelling to the tellers, ‘Go get a camera!’ ” Savoie said. 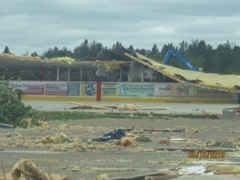 Wadena’s hockey facility was destroyed by the tornado that ripped through the city on June 17, causing an estimated $35 million in damages to the north-central Minnesota town of about 4,000. 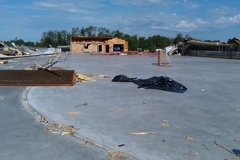 With the arena all but flattened -- its compressors, cement floor and Zamboni were the only major items that survived the destruction -- Pettit was left to wonder about the status of a sentimental item. Pettit, who has been doing radio broadcasts of hockey games at the arena for more than a decade, had grown particularly attached to the stool upon which he has perched himself for all of those years of hockey play-by-play. 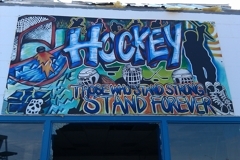 Savoie was part of the team sifting through the rubble at the Wadena Arena Community Center on June 29 when the stool was discovered. With Pettit’s stool in hand, the focus for weeks has been on deciding where the Wolverines will play next season. Savoie and Pat Boline, who is president of the Wadena Hockey Association and a high school assistant coach, insist that games will be played in Wadena. What that means remains uncertain. A temporary structure could be built over the existing concrete slab, a bubble could be erected or games might simply be played outdoors. The boys hockey season begins in late November. 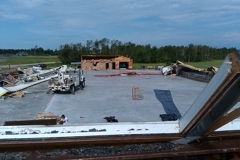 Boline said the plan is to rebuild the community center, but a timeline for completing the project hasn't been established. “As far as what the actual high school season will look like, we don’t even know what the school year will look like, let alone athletics,” Savoie said. “Really, truly those are all possibilities. Savoie said the Wolverines typically would spend much of July practicing in Detroit Lakes. 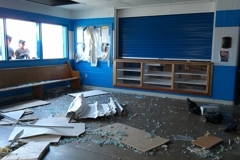 They were unable to follow that routine this year because most of their equipment was stored in the basement of the high school which, like the community center, was in the swath of the tornado and suffered massive damage. The school’s basement is among the last areas to be accessed . Detroit Lakes and Alexandria are among the neighboring towns that have offered ice time.